We left the museum and began walking back toward our hotel. On the way back we passed the National Gallery, which contains over 2000 portraits of England’s most famous individuals. Like the British Museum, the National Gallery is free, but accepts donations. Photos aren’t allowed inside the gallery, so we don’t have anything to show from there. Adjacent to the National Gallery is the National Portrait Gallery, which contains over 2400 portraits. 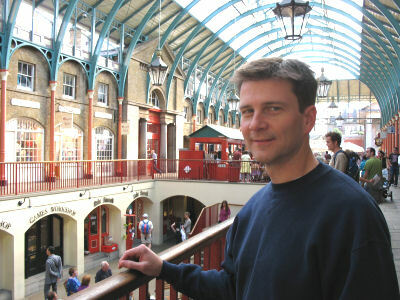 Both galleries are a fascinating walk through England’s colorful history and personalities. We spent probably 90 minutes in the galleries. The galleries border Trafalgar Square, so you can take a rest by the fountain and statues afterward. The most prominent feature of Trafalgar Square is the towering statue of Horatio Viscount Nelson, who died at the Battle of Trafalgar in the Napoleonic Wars in 1805. At the foot of this statue are 4 lions, which we were told are the most climbed upon and photographed statues in the world (although we didn’t take pictures of them ourselves). Apparently, the square used to be covered with about 4,000 pigeons. Today, there are only about 200 pigeons in the square because feeding them has been outlawed, and there is a guy who uses a hawk to scare the pigeons away. 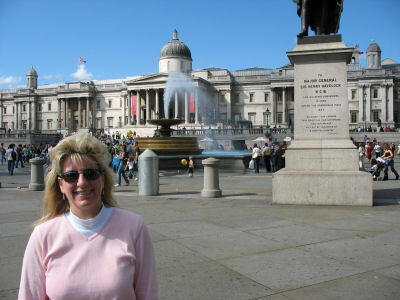 We left Trafalgar Square and walked back to our hotel. We both napped for about an hour, as we were still adjusting to the time change and lack of sleep. After napping we left the hotel again and decided to walk a few blocks to an area of London called Covent Garden. 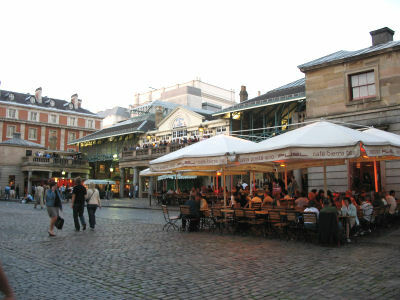 Covent Garden is made up of many different shops, open air antique and flea market, restaurants and cafés, plus the excitement of a pedestrian-friendly area filled with street performers. We arrived just as most of the flea market vendors were closing up shop. However the other stores were open for business as usual and we browsed a few of them. Walking out onto one of the open street areas, we noticed a street performer and stopped to watch. He was doing an act that included juggling, bike riding, but mostly talking and interacting with the crowd directly. His concluding act was to put a bicycle on top of a pole and balance himself while juggling two knives and an apple (which he proceeded to eat while juggling it). He asked several individuals from the crowd to help hold ropes that would keep the pole straight and him safe. I was one of those individuals. When he picked me out of the crowd he immediately said “you’re an American, right?” I don’t think I was being the “ugly American” or wearing anything in particular that gave away my nationality. I guess I just looked American. I noticed myself throughout our trip guessing the nationality of people based simply on their looks, so I guess that was what the performer was doing. 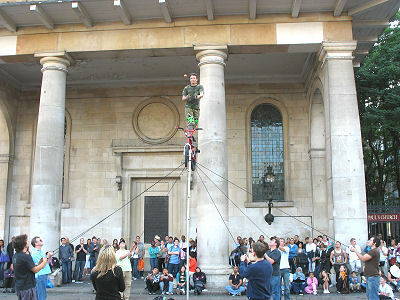 Anyway, he completed his act without dropping the knives or falling off the pole, and he collected tips from the crowd. We continued walking around, and stopped to listen to some very talented singers. They were singing show tunes, opera, and other songs. It made me sad to think that such talented people had to earn their living by singing for tips. They were selling CDs of their music, so maybe they make decent money doing that. Susan and I both were hungry so we started looking for a place to eat. After the less than delectable culinary experience at the pub the night before, Susan wanted a hearty meal that she could enjoy. We looked at a few different restaurants and finally selected one called Maxwell’s (sorry, we didn’t get a picture of the restaurant). It had the look of a chain restaurant rather than a local pub and that appealed to Susan and me as well. (After getting back to Atlanta, I did a little research and found that Maxwell’s was started by a non-native who wanted to dine at something other than a pub. He wanted more of an American-style restaurant. No wonder the restaurant appealed to us.) While I like to find a diamond-in-the-rough type of restaurant, I also like to find restaurants where you know you can count on the food quality. Like it or not I believe that’s what chain restaurants deliver. So we settled on Maxwell’s and got a table. We were seated in a quiet corner of the restaurant on the level below street level. We wondered if they put all Americans in a specific location because all of the people around us seemed to be American. We had a very friendly French waiter who provided very good service. The menu included a variety of items from fish to salads to hamburgers. I ordered a half pound hamburger, which cost 9 pounds. Susan ordered cheese ravioli with mushroom ragout, with shaved parmesan on top.That was 9.85 pounds. She also ordered garlic bread for 2.25 pounds. We both thoroughly enjoyed our food. The total bill was 33.85 pounds, not including tip. After leaving the restaurant we began walking back to our hotel. It was only about 8 p.m., but we were tired and ready to head in for the evening. I updated my journal and we watched some television before going to bed. What Can Your Kids Do In London? To be be kept informed of our regular site updates, simply enter your details below.